New York Rangers President and General Manager Glen Sather announced today that the club has claimed goaltender Alex Auld off re-entry waivers from the Dallas Stars. Auld, 29, has posted a record of 9-6-3, along with a 3.00 goals against average and an .894 save percentage in 21 appearances with Dallas this season. In his last seven starts at home, Auld has posted a record of 6-1-0, registering a 2.51 goals against average and stopping 181-of-197 shots for a .919 save percentage over the span. Alex Auld has played eight seasons in the NHL and was MVP of the Vancouver Canucks four years ago. Auld registered a 4-1-0 mark with a 2.71 goals against average in a five-game stretch from January 16 vs. Detroit to January 29 vs. Colorado that included his 200th career NHL appearance, a 4-3 win vs. Minnesota, on January 18. A veteran of eight NHL seasons, Auld eclipsed the 30-win plateau in 2005-06, recording career-highs in wins (33) and appearances (67) while capturing team MVP honors for the Vancouver Canucks. His 33 wins ranked eighth in the NHL overall. He posted a career-high four-game winning streak twice that season - December 4 vs. Boston to December 15 at Philadelphia and January 14 at the NY Islanders to January 21 vs. Montreal - and a career-best six-game unbeaten streak from October 10 at Detroit to November 4 vs. Columbus (5-0-1). Auld also started in 17 straight games, a career-high, from January 24 at Columbus to March 13 at Dallas, during the 2005-06 season. Last season, Auld posted a record of 16-18-7, along with a 2.47 goals against average, a .911 save percentage and one shutout in 43 appearances with the Ottawa Senators. He notched his sixth career shutout on February 16, stopping all 24 shots faced in a 2-0 win at Nashville. He also made a season-high, 41 saves in a 4-2 win on February 24 vs. Carolina. The 6-5, 223-pounder has appeared in 204 career NHL games with the Vancouver Canucks, Florida Panthers, Phoenix Coyotes, Boston Bruins, Ottawa Senators and Dallas Stars, posting a record of 83-81-2-26, along with a 2.78 goals against average, a .904 save percentage and six shutouts. Auld owns a career 13-9-5 record vs. Atlantic Division opponents. He registered a career-high three shutouts while skating with Phoenix and Boston in 2007-08. 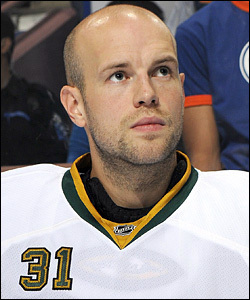 Auld stopped a career-best 47 shots in a 2-1 overtime loss at Toronto while skating with the Florida Panthers during the 2006-07 season. He recorded his first NHL shutout with a 14-save effort in a 6-0 win for Vancouver on March 23, 2003 vs. Washington, and tallied his first career win and assist in his NHL debut on January 23, 2002 at Dallas. The native of Cold Lake, Alberta was originally selected as the Florida Panthers' second round draft choice, 40th overall, in the 1999 NHL Entry Draft.